With the upcoming holidays, here is a quick self-inspection Scrooge List of safety guidelines for decorating your area. Please contact Gilbert Gallegos if you have any questions. NO decorative electrical lights of any kind are allowed for use in the patient vicinity (i.e., any room where a patient receives care). NO natural cut or onc~live evergreen trees or garlands are allowed. 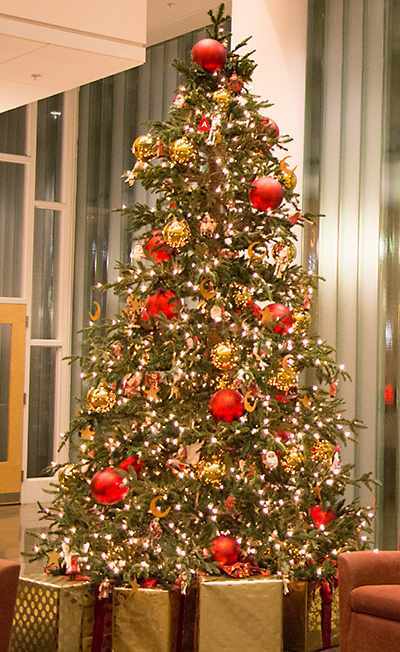 NO artificial Christmas trees are allowed unless labeled or otherwise identified or certified as "flame retardant" or "flame resistant." NO decorations can obstruct exits. NO combustible decorations are permitted. All decorations must be flame retardant and labeled as so. These decorations shall always be kept away from ignition sources (e.g., light fixtures, electrical receptacles, etc.). NO decorations that are explosive or highly flammable are allowed (e.g ., decorative crepe paper or pyroxylin plastic decorations). NO decorations that impair the visibility of an exit sign or portable fire extinguisher are permitted. NO decorations that impair the proper operation of the fire sprinkler system are permitted. Do not attach anything to sprinkler heads. NO decorations may be attached to painted surfaces with tape or staples. Hanging decorations from a ceiling grid is preferable. NO wall decorations in excess of l 0% of the wall surface area are allowed so as not to substantially increase the fuel load.